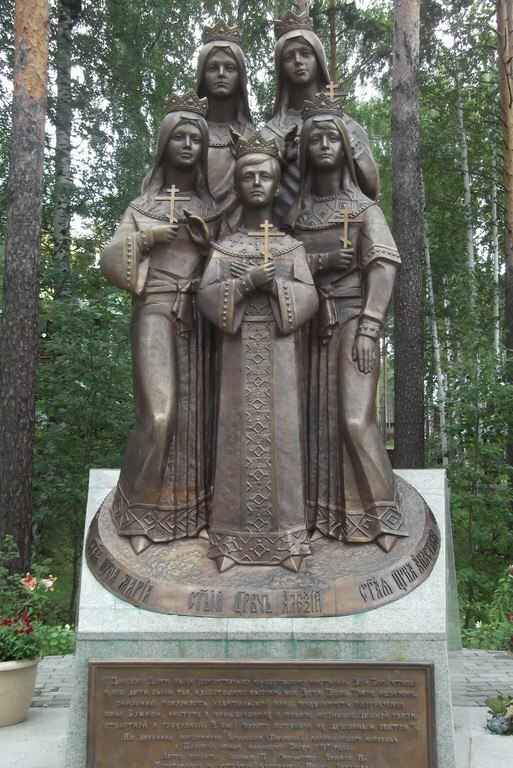 Monument to the children of Russian Tsar Nicholas II was solemnly unveiled on the territory of the Orthodox monastery of the Holy Royal Passion-Bearers on Ganina Yama on November 16, 2011. Besides, it is the site of a mine in which the remains of the royal family and their confidants were discovered. 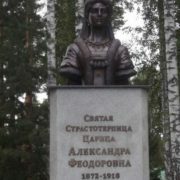 The author of the bronze monument – Igor Vladimirovich Akimov, Ural sculptor, teacher at the Ural State Architectural Academy. 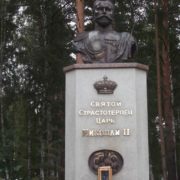 The height of the monument is about three meters, and the weight is almost three tons. 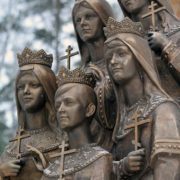 According to the author’s intention, counted to the rank of holy martyrs, the royal children Princesses Olga, Tatiana, Maria, Anastasia and Prince Alexei as if descending from heaven with crosses in their hands on an inclined stone slab that serves as a pedestal. However, not exactly. 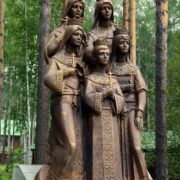 Meanwhile, before that, there had been already installed busts of the royal couple: Emperor Nicholas who was destined to be the last The Russian emperor (2009), and his wife Alexandra Feodorovna (2010). 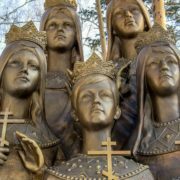 Both are also performed in bronze by Igor Akimov. 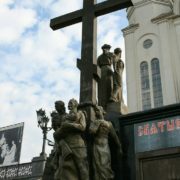 All monuments – connected by one alley leading to “mine number 7” and to the temple of the holy Royal Passion-Bearers. 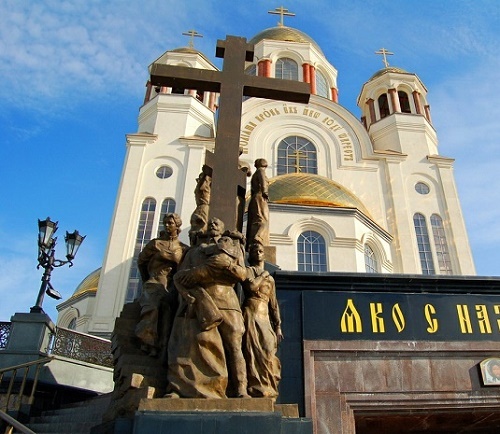 In addition, in 2000-2003, in Yekaterinburg, on the spot where the last Russian emperor Nicholas II and his family were shot on the night of July 16, 1918, on July 17, 1918, local authorities built the Temple-Monument on Blood in the name of All Saints in the Russian Land. Authors: architects VP Morozov, V. Yu. Grachev and chief architect of the region GV Mazaev. Also the ensemble of the temple includes a monument to the royal family. 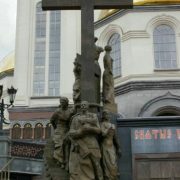 It is the work of sculptors Konstantin V. Grunberg and A. G. Mazaev. 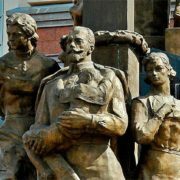 The seven-figure composition represents the tragic moment of the descent of Nicholas II and his family to the basement of the Ipatiev house for execution. 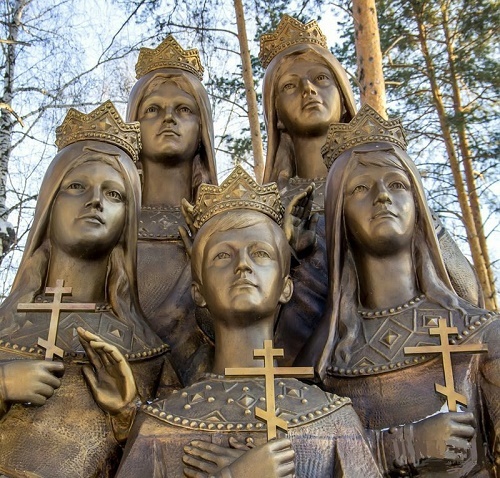 Seven figures settled around the big cross so that the princess with two daughters is higher than the emperor holding the crown prince and the other two daughters. 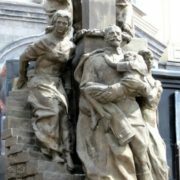 According to the authors’ idea, the monument meets on the way everyone entering the church and involuntarily reminds of the sad events that took place here.